A TJ Maxx/Homegoods opened near me a few weeks ago and the best part is that it shares a shopping center with Guitar Center, so I can ALWAYS convince BF to come with me now :) They have a great selection in the Runway section and although I didn't pick up anything from my most recent trip I thought I'd share some petite-friendly items that caught my eye. Top Likes: I loved the drapey style of this shirt and the neutral off-white/tan color. The fit was good in the shoulder and down the sides. I would love a shirt like this for work, it would go with all of my suits and would be great to mix and match. Top Dislikes: Although the fit was good in some areas, you can see that in the back there was way too much extra material. The sleeves were much too long and I don't think they could be altered due to the shirt being silk. The shirt is way too see through - you can see my flowered bra through the shirt, lol. Although the shirt was silk, it honestly felt kind of like polyester. And for $99, I don't think it was worth it. Bottom Likes: The fit was amazing. I'm not a european size expert, but I thought a 38 would be too big for me in the waist. I picked up this size based on how it looked (which was very small) and it worked out well this time. 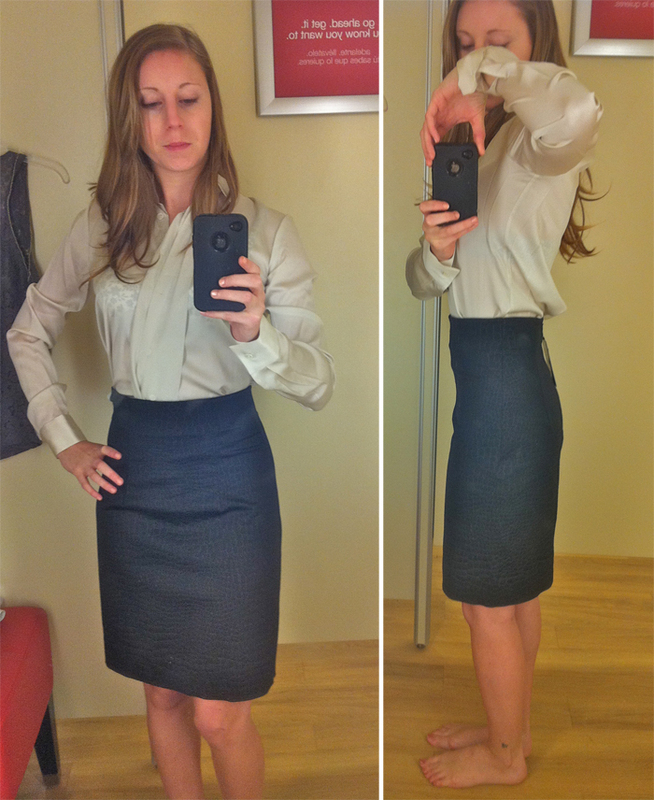 The length was appropriate for work without being frumpy, I like my skirts to hit a little above the knee. Also the skirt wasnt too tight through the thigh, it left enough room between the skirt and my legs to be flattering and very office appropriate. I LOVED the pattern - you can't see it that well, but it was almost a crocodile or snake skin print which added interest to a plain black pencil skirt. Bottom Dislikes: although I didn't have many dislikes, I have to go with the price. For $59, I would have expected the skirt to be lined (it wasn't), and I expected it to be a better material. The skirt was labeled as a cotton/poly blend with silk lining, but since it wasn't lined, I have no idea where the silk was in the skirt. Top: Once again I can't remember. What's the point in doing reviews if you can't remember? Lol I guess I just liked the top enough. As you can see, the top was pretty generous in it's arm hole sizes. That ended up being the deal breaker for me there since the top was only $12.99. If only it was an inch smaller in the arm hole - I would have totally brought this home! Likes: I loved the color - a pretty deep blue/purple. The color is true to the picture. The fit was a good cropped jacket fit. 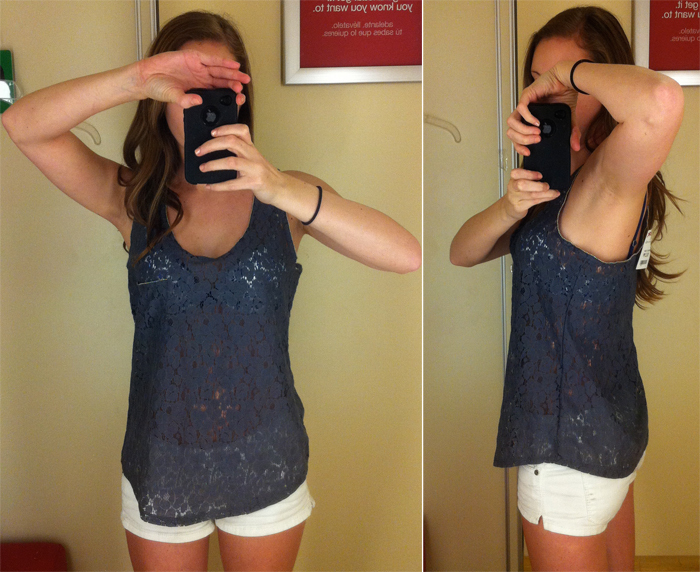 The shoulders fit, the arms were 3/4 sleeve, and the length was good for petites. 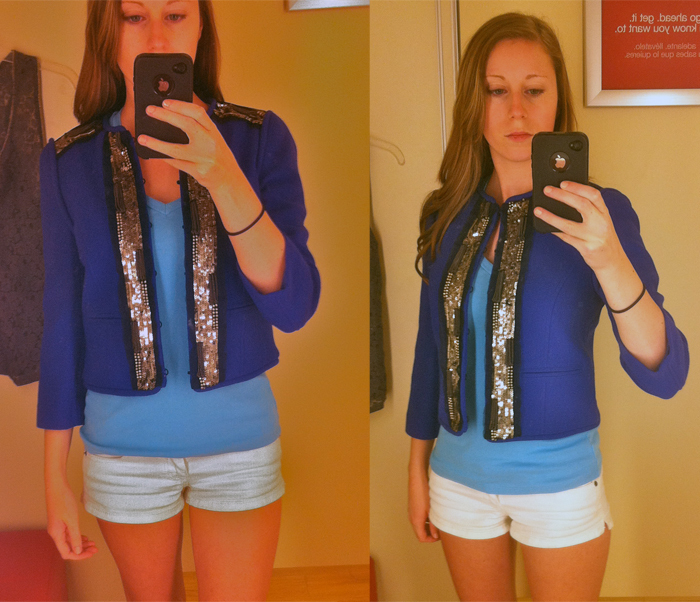 Dislikes: the sequins on the lapel and shoulders. Honestly, if this jacket had had the details from the below yellow jacket, I don't think anyone could have talked me out of buying it. It was just impractical for day to day wear with sequins. Likes: Again, I loved the color. The color in the pictures is true to real life. The fit was the same as the blue jacket. I loved the detailing on the shoulders and lapel - it was much more appropriate for every-day wear. Above is a close up on the details. Honestly, if readers can convince me to go back and pick up one of them for $149.99, I would totally do it despite BF's wishes (heck, we don't share money, yet!) Let me know what you think! Otherwise, I hope this stuff is at your local TJ Maxx for you to try on! Hope that you have had the chance to check out our Tiffany & Co. necklace giveaway. Oh my goodness I love those two jackets! Those colors are amazing!! Thanks for visiting my blog! 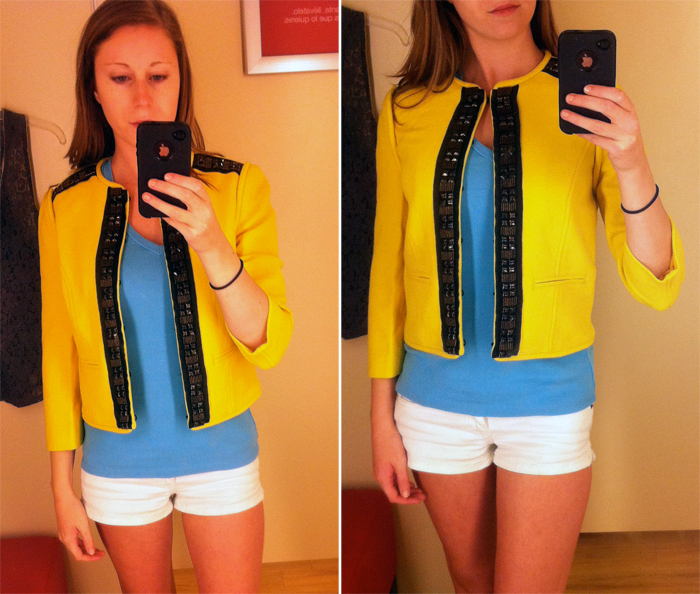 First of all, loving your Tibi jackets!!! BEATUTIFUL! Second, thanks for stopping by! Love your blog - following you - stop back soon :-). 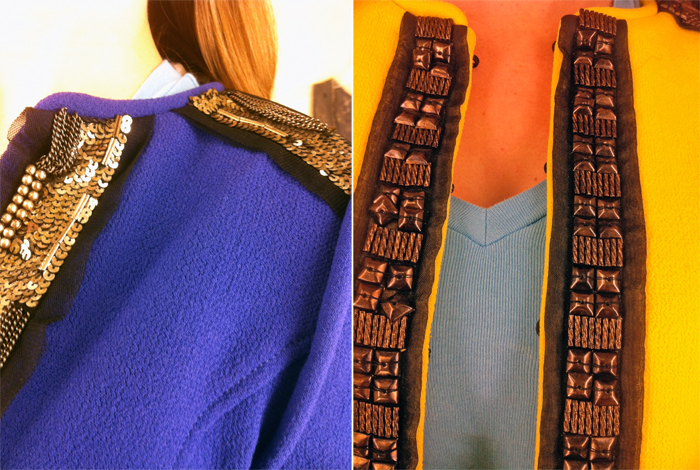 I LOVE LOVE LOVe those tibi jackets! Both colors are absolutely STUNNING! I think the blue is my FAV!!!! And the trim on it is fab! it gets chilly down here! it hits 36 at night by december!!! oh wow, great photos, those clothes look so amazing! Visit Professionally's profile on Pinterest. Amrita Singh site wide 50% off sale!